Canadian cuisine has many food recipes that are using the famous potatoes from Prince Edward Island. In this Canadian Potato Carrot Muffins food recipe, they are combined with carrots for a delicious moist muffin. In large bowl, combine flours, sugar, baking power, baking soda, cinnamon and salt. In second bowl, combine oil, milk and egg. Add to dry ingredients along with carrots, potatoes and raisins, stirring just until moistened; do not over mix. 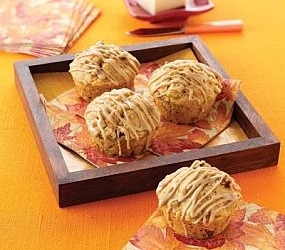 Spoon into 12 medium paper-lined or nonstick muffin cups, filling ¾ full. Bake in 350°F (180°C) oven for about 20 minutes or until muffins are lightly browned and firm to the touch.